One of the new features in Exchange 2010 is the ability to import contact photos, store them in Active Directory against each user, then show them in both Outlook and Lync. It’s great to help identify who you’re emailing and who has emailed you, and can avoid making embarrassing mistakes. The process to enable the photos is fairly straightforward. You need to update the AD schema to 2008 or higher (you can still use 2003-only domain controllers, though), enable Global Catalog replication for the relevant attribute, enable the photo to be distributed through the Offline Address List, and then import small (<10K), 96×96 photos into AD using Exchange cmdlets. Full details on how to do this is on the Exchange Team Blog in the article GAL Photos in Exchange 2010 and Outlook 2010. However, it’s worth noting that this new feature isn’t limited to Outlook 2010 clients. 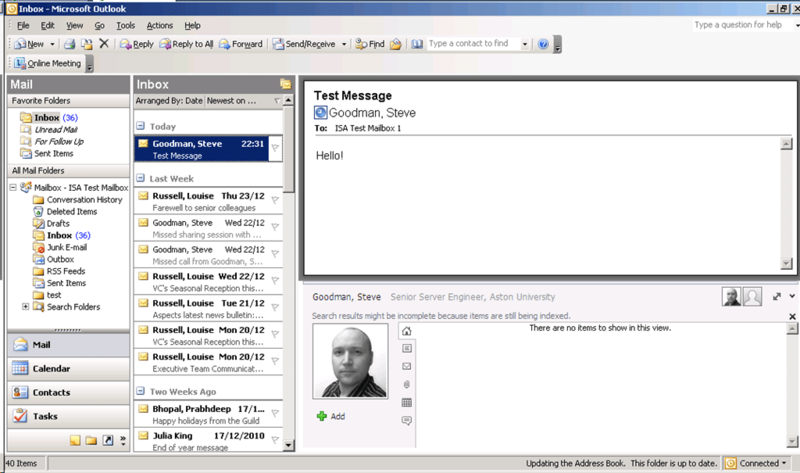 You can also enable this feature on Outlook 2003 and Outlook 2007 clients, by installing the Outlook Social Connector. The OSC is primarily aimed at enabling connections between social networks, such as Facebook and LinkedIn. However, out of the box it enables GAL photos to be displayed in both older versions of Outlook. By using the Outlook Social Connector, you don’t get all the fancy features Outlook 2010 enables for GAL photos, such as the contact card feature and display of the photo when browsing the Global Address List, but it does show the photo in received mails and in the preview pane. Without a full client upgrade, I think this is a pretty good compromise. As you can see, it’s pretty much the same as the social connector in Outlook 2010. Installation on a single client is fairly straightforward. 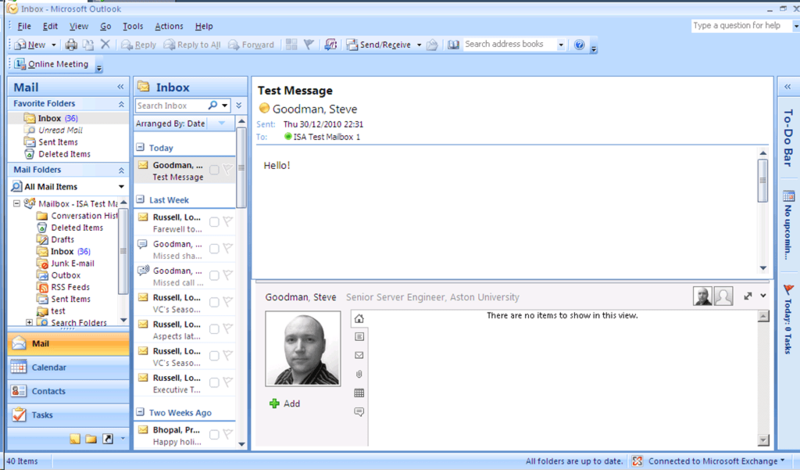 The Outlook Social Connector can be downloaded from the Microsoft site, and after installation, first run will allow the user to configure which social networks to connect to, after which GAL photos will now appear in Outlook. 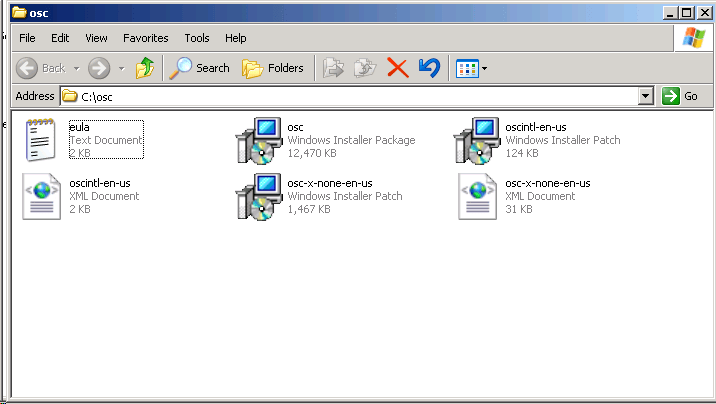 First, you need to download the OSC onto an administrative workstation and extract it. The installer is an EXE, however inside is an MSI (and some MSPs) that you can use for Group Policy Deployment. Now, that will get the OSC out to the clients. To ensure your users don’t have to deal with the first-launch experience (where they have to press Next, choose from a blank list of networks, then press Finish before they can use Outlook), we need to configure a couple of Registry entries. The easiest way to accomplish this is via Group Policy Preferences. I won’t go into too much details, but basically you can configure Group Policy Preferences by using Server 2008, 2008 R2, Vista or Windows 7 Group Policy Management tools. The client extensions can be deployed easily using WSUS to earlier clients like Windows XP. Once configured the Outlook Social Connector should deploy to client machines, and be enabled with no user interaction. Word of caution – always make sure you test these changes for yourself first in your own test environment before deploying to real clients. To make OSC display photos in Outlook 2007 disable “Use Cached Exchagne Mode” for your account. According to this post: http://support.microsoft.com/kb/2020103 it should work in Cached mode as well, but you have to include the thumbnailPhoto attribute in your OAB as a Value. Unfortunately, this didn’t work for me… so just switch to Online Mode. Steve, Firstly thanks for this helpful article. I followed all the instructions, added my photo to AD, which showed up in my Outlook 2007 (cached and uncached). Then I added my Manager’s photo, but it hasn’t shown up for me, him or anyone else, neither has my photo for anyone else. As an aside my photo shows in my WP8 Nokia Lumia 920 smartphone, but my manager’s photo doesn’t and neither photo shows on his phone (same phone). I have a question how do you stop your picture being used in this fashion, within Lync i can stop my image being displayed but I want to make sure it cannot be used in Echange or Sharepoint as I do not want it to be seen, as I do not even have photos on facebook I do not see why my company is allowed to post it where ever it wants with out permission. Steve – is there any way of troubleshooting this, I can successfully display thumbnail Pictures in Outlook 2010 in my organisation but not on Outlook 2007s. the OSC pane shows up fine but without the photos ..
You’re missing one registry entry to trick Outlook into not displaying first launch experience: PrimaryOscProfile – (REG_SZ – string) – Outlook. Cheers, I’ll see about updating the article. It works fine to install OSC with group policy as your instruction, however, when user run Outlook, there are some popups to activate OSC. Is it possible to make it completely no user interaction? This group policy was my best attempt at that – it seemed to work in most scenarioes for me, but I wasn’t able to catch every scenario as the way I attempted to catch the popups isn’t documented by Microsoft. Yes it requires cached mode which is not usually used on Terminal Servers. Thanks for the info. However when creating the group policy as you’ve shown above I cannot see an option to modify the registry settings. Would you please be able to let me know which template I need to download to see this? I have the registry setting option on my Server 2008 AD but Server 2003 AD. You need to use the RSAT on Windows 7 or Server 2008 to use Group Policy Preferences on a Windows 2003 Active Directory, and ensure that the Group Policy Preferences extensions are deployed to client PCs. 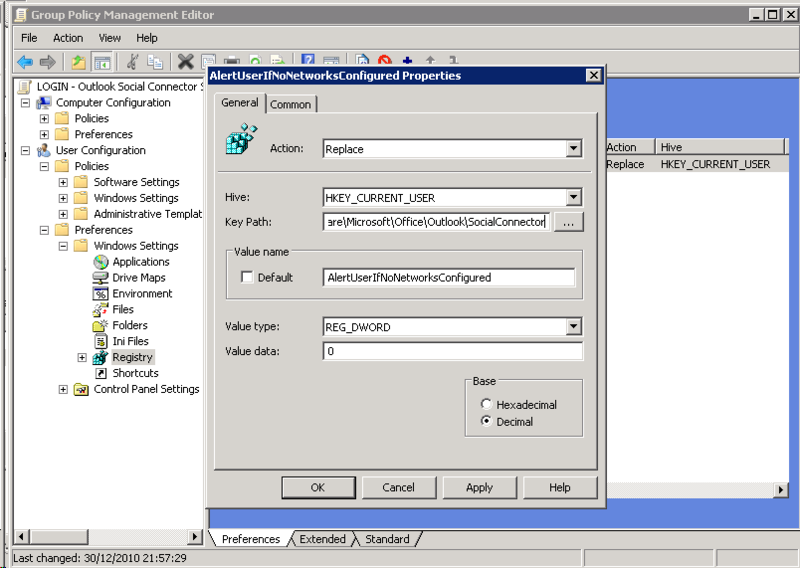 I have gone through the steps to upload all of my photos into the Active Directory through the Exchange Management Shell. I have tested them in Outlook 2010, and all of the photos are displayed correctly. However, I have installed the Outlook Social Connector in Outlook 2007, but the photos are not displaying there. After reading this post, I am under the impression that it should work automatically once the Outlook Social Connector is installed. I would like the photos to show up in Outlook 2007, so does anyone know why it might not be working for me? Thanks in advance for the help. With Outlook 2010 all photos are visible. With Outlook 2007 and social connector only some few photos are displayed. (Running on Exchange 2010 and 2008 R2 AD controllers.) The problems only occure only in buffered mode. With Outlook 2010 all photos are visible. With Outlook 2007 and social connector only some few photos are displayed. 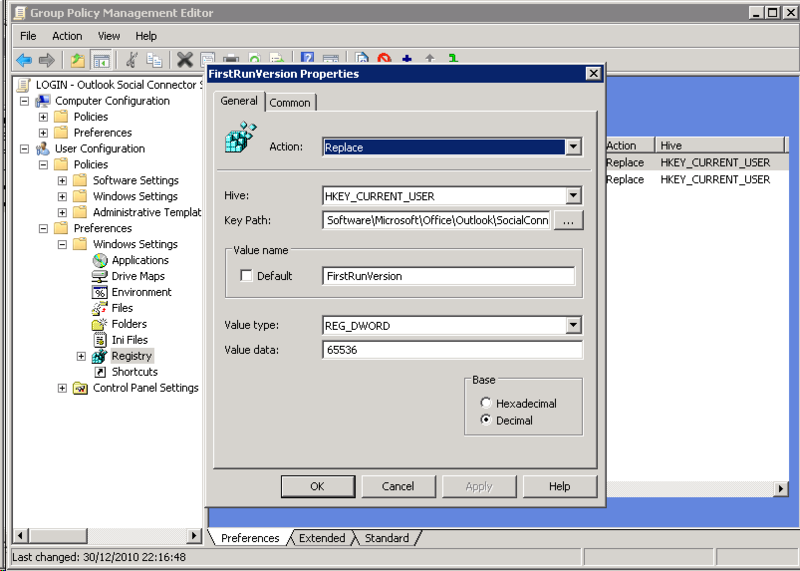 (Running on Exchange 2010 and 2008 R2 AD controllers.) The problems only occure only in cached mode. I followed your instructions but seem to have issues with thumbnail photos showing up on people pane/Outlook social connector at the bottom of page. How do you use Outlook Social Connector in Outlook 2010 to show photo? Any suggestion? Can pictures also be applied to Exchange GAL Email Distribution Groups?